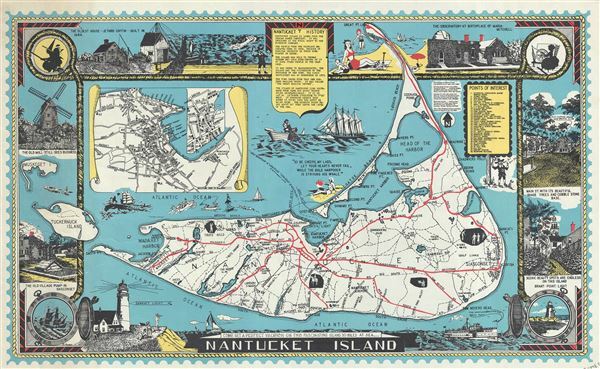 This is a charming c.1946 pictorial map of Nantucket Island by L. Parker. This beautiful tourist map covers Nantucket Island including the smaller Tuckernuck and Muskeget Islands. An inset on Nantucket Town in included in the top left quadrant of the map. Throughout, several roads, harbors, beaches, ports, ponds and other topography is noted. Beautiful pictorial illustrations of ships, sailboats, fishing boats, fish, a buoy, a woman on a beach and Sankaty Light with Native Americans and a man with a telescope can be seen. The map is surrounded by an elaborate border on three sides with vignettes depicting historical places and island activities, including 'The observatory at birthplace of Maria Mitchell,' beach activities at 'Great Point Light,' 'The old village pump in Siasconset,' 'The oldest house – Jethro Coffin – built in 1686,' etc. The four corners depict a lighthouse, a sailboat, a witch riding a broom and a woman spinning yarn. A note on the history of Nantucket is featured in the top center and a key to 36 points of interest in included in the top right quadrant. A charming poem about New England in included. The whole is surrounded by a woven rope border. Above the title, the line 'Come get a perfect vacation on this fascinating island 30 miles at sea…' invites visitors to this popular tourist destination and summer colony. This map is copyrighted by L. Parker.